US, European and Japanese share markets rose solidly over the last week on increasing signs from the Fed that it is open to pausing or slowing its interest rate increases. Chinese shares rose slightly but Australian shares fell slightly. Weakness in resources, consumer, utility and real estate shares weighed heavily on the Australian share market over the last week offsetting gains in financials and industrials. Reflecting a more dovish Fed and generally low inflation readings bond yields mostly fell. Commodity prices were mixed with metals and oil up a bit, but iron ore down. The $A rose as the $US fell slightly. Two weeks ago, three potential positives for shares were noted in this update: a Fed pause, the oil price crash extending the cycle and some hope on the trade front. We are still waiting for something on trade, oil prices have since fallen even further providing a boost to consumers and comments over the last week from Fed Chair Powell and Vice-Chair Clarida along with the minutes from the last Fed meeting have added confidence to the prospect of a pause in rate hikes next year. The key message from the Fed is that it remains upbeat on the US economy – consistent with another hike in December, but that rates are now “just belowneutral” and it needs to be aware of potential headwinds to growth including the lagged response in the economy to past monetary tightening and that there are no major excesses to deal with, which is all consistent with the Fed being open to a pause and slower pace of rate hikes next year. Following a hike in December the Fed is likely to lower its “dot plot” of rate hikes for 2019 and replace the reference to “further gradual [rate] increases” in its post meeting statement with a reference to being more data dependent. A pause on rates in the first half of next year is now highly likely particularly if core inflation continues to remain benign. A slower more cautious Fed would be positive for markets as it would reduce fears of a US downturn and take pressure of the $US which would provide some relief for emerging markets and commodity prices. China could kick of negotiations offering a broad-based reduction in its tariffs. China’s average tariff rate last year was 9.8% and the US’ was 3.4%. While China is allowed a higher tariff rate under WTO rules as a developing country getting it down has been a key demand of Trump and China has been moving in this direction anyway and has been reportedly thinking about doing more. It is likely to see some sort of positive outcome from the Trump/Xi meeting as both sides want a deal, but it’s a close call. Either way it is likely that Trump will want to resolve this issue sometime in the next six months before the tax/tariff hikes wipe out all of the remaining fiscal stimulus next year and start to act as a drag on US economic growth pushing up prices at Walmart and pushing up unemployment threatening his re-election in 2020. Stronger Australian budget position likely to see the Government announce tax cuts ahead of next year’s Federal election. PM Morrison’s announcement that next year’s budget will be brought forward to April 2 is clearly designed to clear the way for an election in May (on either May 11 or May 18). Meanwhile, the Mid Year Economic and Fiscal Outlook report to be delivered on December 17 is likely to show that Federal budget is running around $9bn per annum better than expected thanks to higher than expected commodity prices and employment driving stronger tax revenue only partly offset by fiscal easing measures. This suggests this year’s budget deficit projection is likely to fall to around -$6bn (from a projection of -$14.5bn in the May Budget) and the 2019-20 surplus on unchanged policies will be projected to be around +$11bn (up from $2.2bn in May) with future surpluses looking even stronger. This is likely to enable the Government to announce $9bn in income tax cuts and other pre-election goodies starting in July 2019 and still maintain a surplus projection for 2019-20. The big risk of course is that the revenue windfall is not sustained as slower Chinese growth weighs on commodity prices, jobs growth slows and wages growth remains weak. The upside of bigger and earlier income tax cuts is that it will inject a bit of spending power into household budgets providing a partial offset to what looks like being an intensifying negative wealth effect from falling house prices on consumer spending next year. So, while it’s likely to see pretty constrained consumer spending growth next year it’s not all doom and gloom. Eurozone sentiment slipped for the 11th month in a row and bank lending slowed all of which will keep the ECB cautious. Australia data released over the last week was messy with a sharp fall in September quarter construction activity that was broad based across residential and non-residential building and engineering activity, a fall in September quarter private new capital expenditure and continuing softness in credit growth. 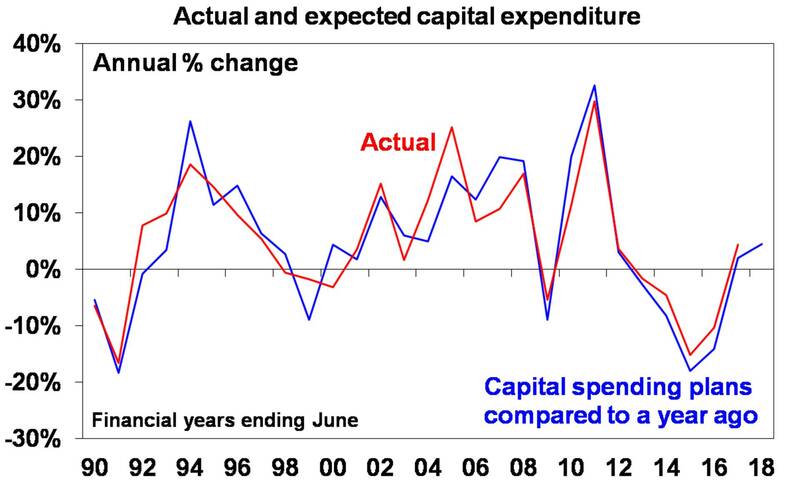 There was good news though in that business investment plans for the current financial year continue to improve with capital spending plans compared to a year ago growing at their fastest in six years as the slump in mining investment slows but non-mining investment improves. 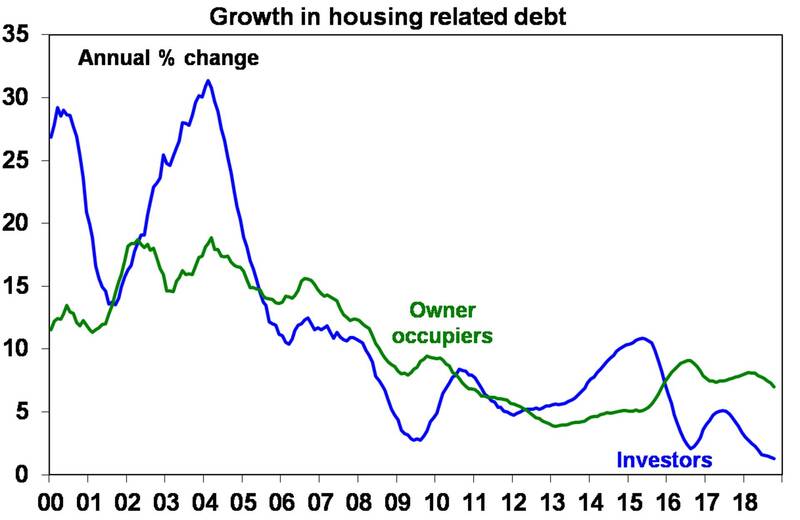 So, business investment should help provide an offset to the downturn in the housing cycle. In the US, jobs data to be released Friday will be the focus. Expect to see another solid gain in payrolls of around 200,000, unemployment remaining at 3.7% and wages growth rising to around 3.2% year on year. In other data expect the November ISM manufacturing conditions index (Monday) to edge down to a still strong 57.5, the non-manufacturing conditions ISM index (Wednesday) to edge down to 59.5 and the trade deficit (Thursday) to widen slightly, Another speech by Fed Chair Powell (Wednesday) will likely reinforce the impression that it’s becoming open to a pause in rate hikes next year and the Fed’s Beige Book of anecdotal comments will be released the same day. There is also another bout of shutdown risk in the US in the week ahead with the need for another “continuing government funding resolution” to avoid another US government shutdown from December 7 – this could create a bit of noise given Trump’s past threats to shut down the government if he doesn’t get funding for his wall but ultimately an extended shutdown in the run up to Christmas is in neither sides interest. And a lot of spending measures have already been approved so the scale of any shutdown will be small with little economic impact. In Australia the RBA will leave rates on hold for the 26th meeting in a row. The RBA remains between a rock and a hard place on rates. Strong infrastructure spending, improving non-mining investment, a lessening drag from falling mining investment, strong export earnings and a fall in unemployment to 5% are all good news. But against this the housing cycle has turned down, this will act as a drag on housing construction and consumer spending via a negative wealth effect, credit conditions are tightening, wages growth remains weak, inflation is below target and share market volatility is highlighting risks to the global outlook which is a potential threat to confidence and export earnings. So yet again the RBA will remain on hold. Views remain that rates will be on hold out to second half 2020 at least with a rising risk that the next move will be a cut before a hike. On the data front expect a continuing slide in home prices for November and a 1% decline in building approvals for October (both due Monday), trade data (Tuesday) to show a 0.2 percent contribution from net exports to September quarter GDP growth, September quarter GDP growth (Wednesday) to come in at 0.6% quarter on quarter or 3.3% year on year helped by solid net exports and public demand but soft consumer spending and dwelling investment and weak business investment, October retail sales to rise by 0.3% and the trade surplus to fall back to $2.9bn (both due Thursday). Shares remain at risk of further short-term weakness, but it it likely to see the trend in shares remaining up as global growth remains solid helping drive good earnings growth and monetary policy remains easy. Having fallen close to the target of $US0.70 the Australian dollar is at risk of a further short-term bounce as excessive short positions are unwound and the Fed moves towards a pause on rate hikes. However, beyond a near term bounce the $A likely still has more downside into the $US0.60s as the gap between the RBA’s cash rate and the US Fed Funds rate will likely push further into negative territory. Being short the $A remains a good hedge against things going wrong globally.